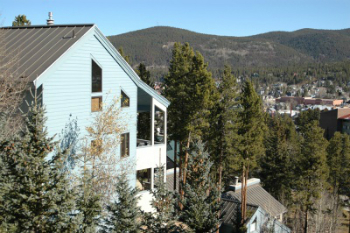 Chimney Ridge townhomes are tall and narrow, built on the popular ski-hill side of the Blue River Valley, just a block above downtown Breckenridge. The Chimney Ridge townhomes for sale and several other projects like it were built in the 1990s to take advantage of the Snowflake Lift, which was then a new addition to the lift network at the Breckenridge Ski Resort. These town homes were built in 1994, with an exterior of wood, stucco and river stone, and have been recently updated. Start your search with the Chimney Ridge townhouse listings below, or read more about this incredible community. Similar to several of the townhomes in this area, Chimney Ridge townhouses have garages on the first level with living above, and bedrooms further above, Chimney Ridge is architectural unique by virtue of dramatic angular roofs that cover the up-level outdoor decks and shade the floor to ceiling living room windows that face the Tenmile Range. From Chimney Ridge, the Snowflake lift is up the block on the northwest corner. From Peak 8 it’s easy to ski down Four O’Clock or Snowflake run to return home. 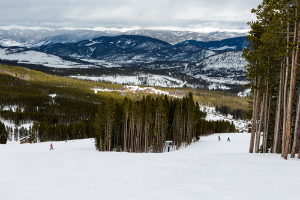 These runs are part of the national forest and can be used in summer to hike farther up the ski mountain or connect with other hiking and mountain biking trails. Downtown Breckenridge begins just a block downhill from Chimney Ridge, and since this part of the ski hillside of Breckenridge is slightly steep, the east-facing windows have an unobstructed view of Baldy Mountain. Size: 1389 sq. ft. to 1770 sq. ft.
From the traffic circle on the north side of Breckenridge exit onto Park Avenue and continue about .5 mile to Four O’Clock Road, continue uphill and take th e second left on Kings Crown Road. Chimney Ridge have blue wood trim and will be on the left midway along this block. One drive serves as all the Chimney Ridge Townhomes. Don't hesitate to get in touch with us! An expert from Breckenridge Associates is waiting to talk to you.